The Horror Movie BBQ: Some Cereals I Wish Would Still Be Around. Some Cereals I Wish Would Still Be Around. Well, it's National Cereal Day! A day to celebrate the tastiness that is known as sugary oats and marshmallows! Personally, I have a box of Count Chocula that I've been saving for special occasions since October, and I don't see a much more special occasion that today! Better dive in! 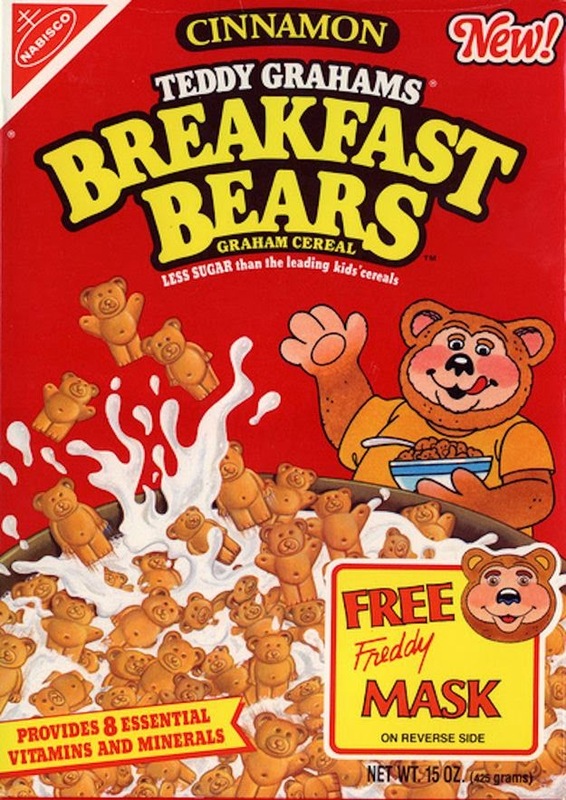 Now, as much as I love current cereals, I've gotta say, there's plenty of cereals I miss from my childhood. A lot that have either been just special promotions for a movie or tv show or just didn't last. Today, I want to take you down the cereal aisle of my past and discuss some of my favorites! First up shouldn't be any surprise. 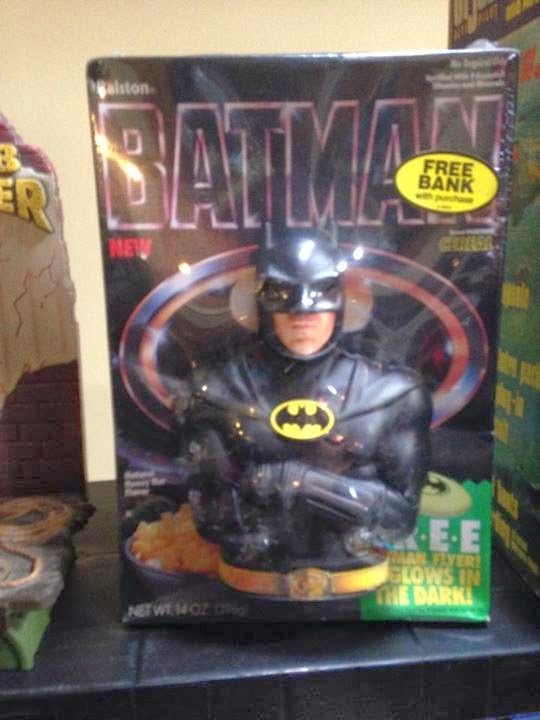 Batman The Cereal. The box, just like everything to do with the movie from 1989, was sleek, dark and mysterious. Black. Gold. Simple. It's a pretty awesome box and even better, some came a bank in the form of the Dark Knight himself! I don't have the box, but I do have a mint condition bank! Now, the cereal itself was nothing more than Captain Crunch in the form of the Batman logo, but that doesn't take away from the fact that it was so delicious! And back then, anything with Batman was a success. This cereal by Ralston(you'll see them pop up more) was no different. No marshmallows, but that didn't take away from it's amazingness in my opinion. Another entry by Ralston! Ok, this one wasn't as delicious as the others as much as it is just very weird. See, it was too bags of cereal in one. You can tell by the box, but it still doesn't do it justice. I tend to remember the taste itself was pretty bland on both sides. Mario was a fruity concoction while Zelda was more of a berry variety. My taste as a child is different than now, obviously. Back then I wasn't a big fan of berry flavored cereals. Today I welcome it. So I feel like if this were done again, I'd prolly like it better. 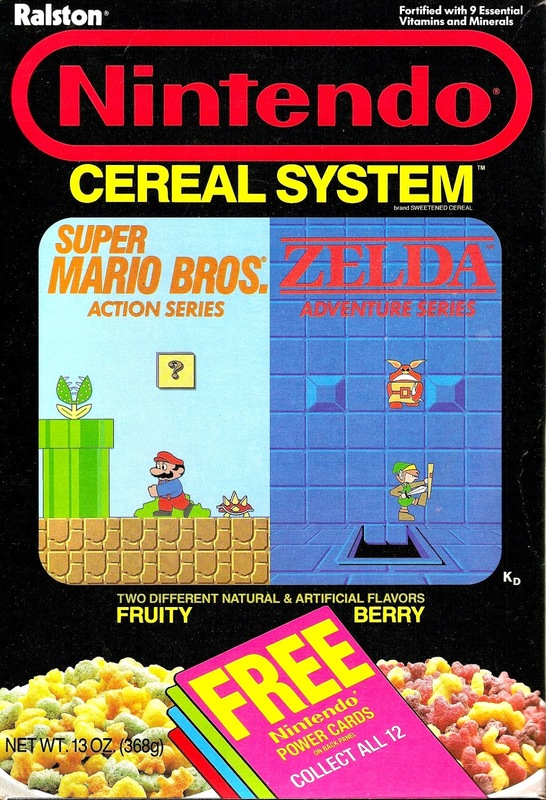 Taste aside, it was a clever idea and Nintendo was white hot at that time, so Ralston definitely gave us, good or bad, a memorable cereal. I'm kinda surprised no company has tried to do this since. I feel like the "two in one" box could be better done today. Not the most delicious cereal, but still delightful. This cereal was like mixing all the fruity Monster Cereals together, but taking out the marshmallows and just a little less tasty. Which, I guess isn't bad, but I just tend to remember thinking it was eh. But that's not that why I loved it. Check out that box. 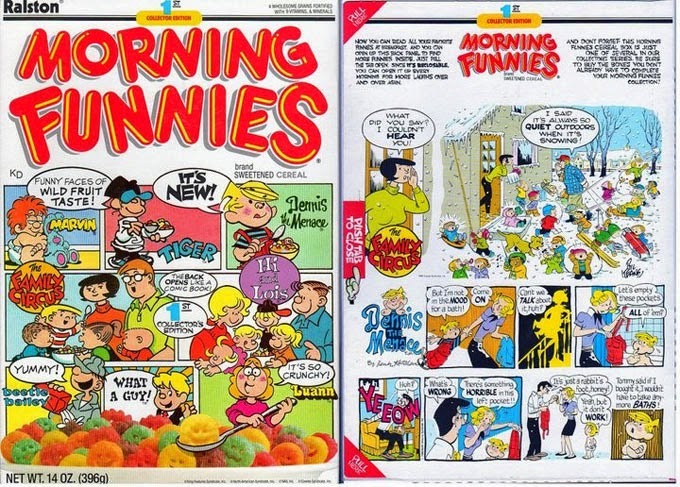 My favorite Sunday Morning comic characters(that aren't named Snoopy or Garfield or Calvin and Hobbes) were at my breakfast table every morning now. If memory serves me right, different boxes had different strips, so every box I got was a different laugh. So, that's always a nice thing to have at the table! I saved my favorite for last. 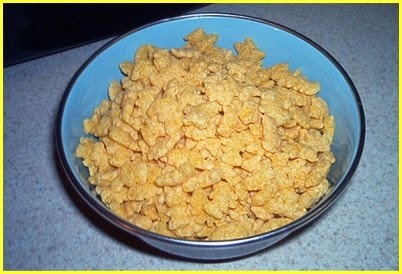 Quite frankly this is my all time favorite cereal from the past. Yes, I'm very aware it's nothing more than Chex with Marshmallows (As shown in a great entry by my buddy at The HolidazeBlog!) but between the smell of the box when I'd open it, the taste of the Chex mixed with the marshmallows and eating them out of a Ninja Turtles bowl, it was a perfect combination. And much like Batman, nothing the Turtles could touch could fail at that time. The memories of eating these on the couch while watching cartoons on Saturday or before school, are some of my fondest as a child. And hey! I still have the bowl that came with it! It's banged up, apparently has pen marks and ink stains but if I could remove those, I'd use it in an instant!!!! So there you have it. Some of my favorite breakfast companions. Some remembered fondly, some forgotten. Some tasty, some bland. Either way, they were delightful to have at the table! Go Ninja, go Ninja, go! 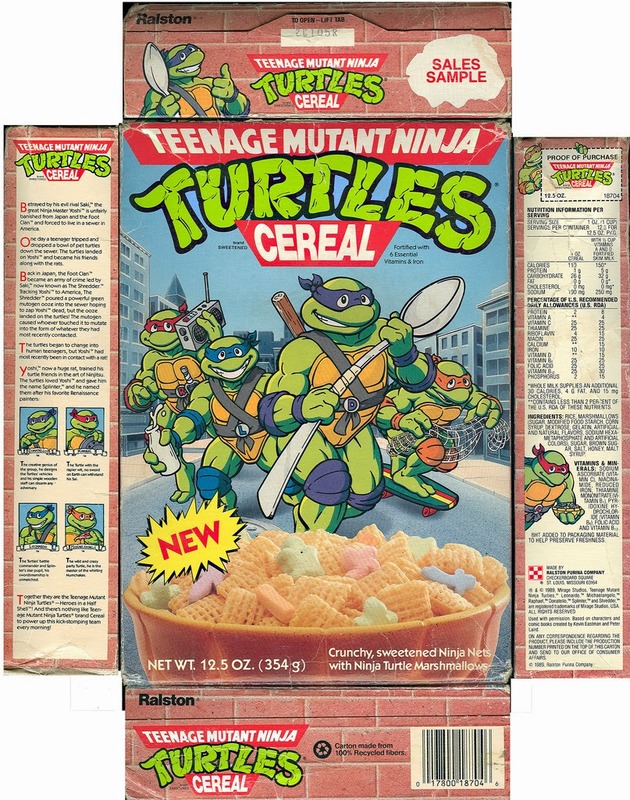 I'd eat that TMNT cereal again in a heartbeat. Oh, I think we all would. I'm very much planning on making my own version. Yes, it's nothing more than Chex and marshmallows, but screw it. I need it! 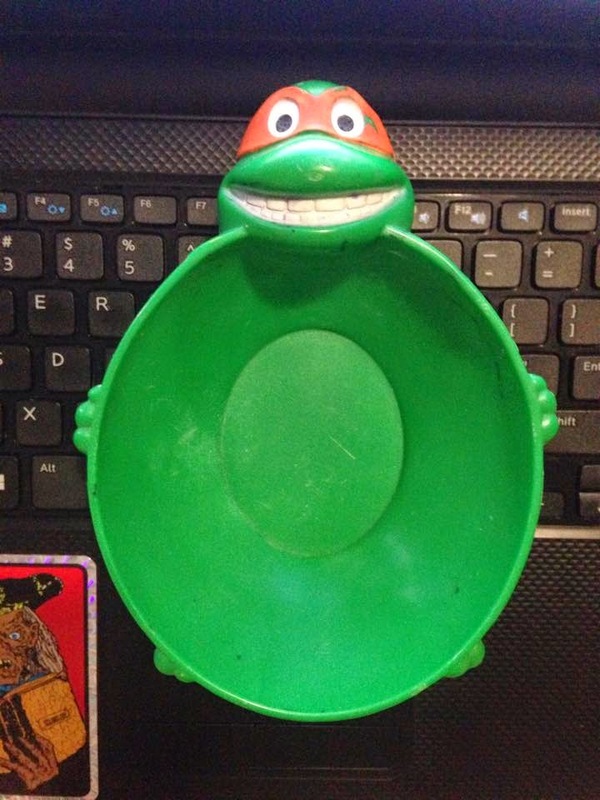 Ninja Turtles At 25 Giveaway! WrestleMania Memories with guest Thomas Bryce! Monster Mania Recap: Awesome Scores!! !